Quality, all-American fare is served up to patrons that include fun-loving regulars. : A Valley standby, especially during spring training, Don & Charlie's is also where winter visitors taking in the Cactus League baseball games line up for generous (albeit pricey) portions of good all-American food. Meals begin with complimentary liver pâté and lavosh. 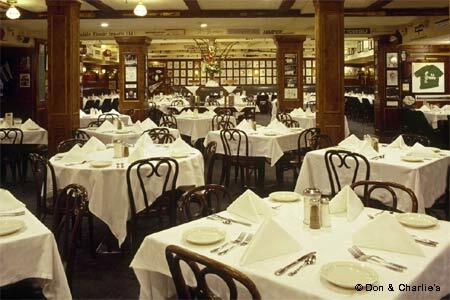 As for entrées, most people come for the barbecued ribs or steaks (selections include rib-eye, filet mignon and New York strip), but others go for calf’s liver with peppers, onions and mushrooms, lamb chops, chicken schnitzel or seafood. For a quicker meal, try the burger bar stocked with a selection of big, juicy sandwiches like the Cabo, which comes topped with guacamole and pepper jack. It's the noisy, fun-loving crowd of regulars that give Don & Charlie's its character.